Each month we host a Graphic Novel Book Club meeting, open to all, during which we hang out and informally discuss a featured graphic novel. 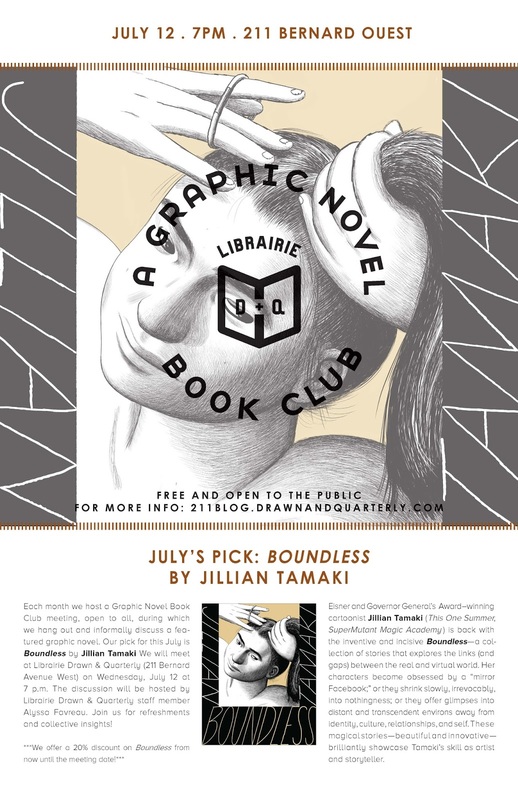 Our pick for this July is Boundless by Jillian Tamaki We will meet at Librairie Drawn & Quarterly (211 Bernard Avenue West) on Wednesday, July 12th at 7 p.m. The discussion will be hosted by Librairie Drawn & Quarterly staff member Alyssa Favreau. Join us for refreshments and collective insights! Eisner and Governor General's Award-winning cartoonist Jillian Tamaki (This One Summer, SuperMutant Magic Academy) is back with the inventive and incisive Boundless, a collection of stories that explore the links, and gaps, between real world and virtual. Her characters, who in turn become obsessed by a "mirror Facebook," or shrink slowly, incontrovertibly, into nothingness, offer glimpses of distance and transcendence from one's identity, culture, relationships, and self. Each more beautiful and innovative than the last, the magical stories brilliantly showcase Tamaki's skill as artist and storyteller.